This study defined the field performance potential for 34 genotypes that composed a somatic seedlot of interior spruce (Picea glauca (Moench) Voss × Picea engelmannii Parry ex. Engelm.) crosses, white spruce (P. glauca (Moench) Voss) crosses, or a mixture. Each genotype was measured for morphological attributes: height, diameter, shoot dry weight, root dry weight, shoot-to-root ratio, height-to-diameter ratio at time of lifting. Each genotype was also measured for physiological attributes of cuticular transpiration (TFDcut), osmotic potential at turgor loss point (Ψtlp) and freezing tolerance (index of injury at −6°C and −4°C; II@−6 & II@−4) during inactive and active shoot growth phases. Shoot growth potential (SGP = length of new leader elongation) and root growth potential (RGP) were conducted under four environmental regimes: nutrient-rich/well-watered, nutrient-poor/well-watered, low root temperature, and planting stress conditions. The somatic seedlot met target height, diameter and RGP standards for a plantable seedling crop in British Columbia, Canada, though genotypes differed in morphology at time of lifting. These genotypes also differed in their measured physiological attributes (TFDcut, Ψtlp, II@−6 and II@−4) at time of lifting and during active shoot growth. Genotypic differences were also found for SGP and RGP under different testing environments. 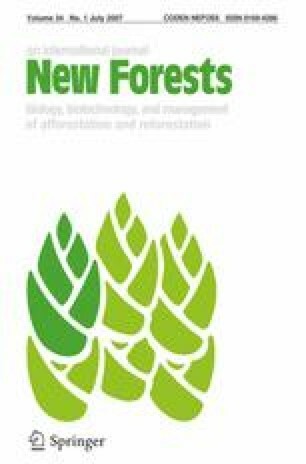 A stock quality assessment program describing elite genotypes within a seedlot can aid foresters in applying benefits of clonal forestry. Raymund S. Folk is now self employed.